Let’s say you just got wind about the job of a lifetime and you want to leapfrog other candidates to the front of the line. “I’ll email someone directly,” you’re likely to decide. However, you’re not connected to anyone on LinkedIn, and you don’t have an email address for the hiring manager. How can you do some sleuthing to find email addresses for hiring managers and recruiters ? Even better, how can you uncover the coveted email addresses for free? Here are three ways to find email addresses for hiring managers and recruiters for free. The secret (shhh… don’t tell your job search competitors)? Use the tools that recruiters use every day to find job candidates, but in reverse. Here are three email-finding tools that are completely free. Each has a monthly or weekly limit for the free version of the tool, but you can use them all concurrently to expand your total search capacity. **One note: make sure that the email addresses you actually use are NOT the personal/home email address of the hiring manager; you’re only looking for work email addresses. Recruiters use ContactOut to find you; now it’s your turn to flip the script and use it to find them (or a hiring manager). Simply install it as a Chrome Extension and try it when you’re on a hiring manager’s LinkedIn profile or any other available page. 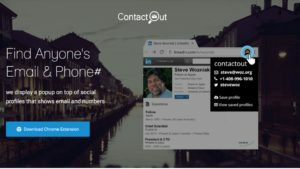 Also a favorite of recruiters, Hiretual lets you find up to 10 contacts per week for free. If you’re serious about tracking down a hiring manager or contact within a company, leverage Hiretual’s extensive data aggregation and cross-referencing power. Beloved by recruiters and sales people, Hunter lets you enter a name and a company and goes to work digging up either confirmed (or, if they don’t have an exact match, a best guess) email addresses for you. The next time you get a hot job lead and want to send that perfectly crafted email to a hiring manager, or you want to connect directly with a recruiter, use the tools that they use. They’re free, they’re powerful, and they’ll position you as a candidate who knows how to use technology and data to work efficiently. Any other tools you love for finding email addresses? Share the love in the comments so that others can benefit from your advice. Great suggestions as always Kathy—you are the one to listen to and follow. Thank you for sharing about Hiretual.com, Kathy!